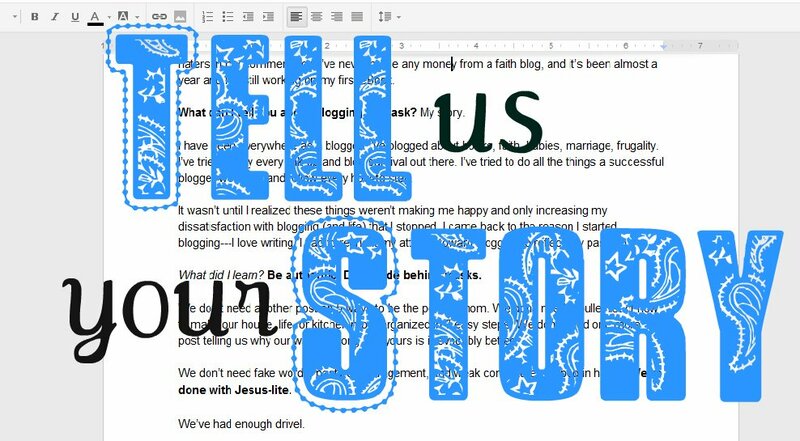 Can All Bloggers Tell Their Story? One of the things I tried to do, but struggled with, in the post was covering multiple blogging niches. I write primarily about my faith journey, what God is showing me and how I’m processing life. It tends to be more reflective and oftentimes takes a serious tone. But because that is the type of writing I do it is naturally easier to share my story than it may be for a DIY craft blogger or frugal blogger. It’s an integral part. However, I don’t think it’s impossible for a blogger in a different niche to share their story. It just might look different. It doesn’t have to be heavy. Telling your story can be sharing your shortcomings, how you messed up on a project, or some insight the daily grind has revealed. It doesn’t have to be long. You don’t need to write 5 paragraphs for us to know you’re being real, that you’re not hiding behind a mask of perfection. You can do it in a sentence or a picture. Whatever suits you. But I believe it is important, even in a bullet list, to share more than your conclusion. tell us what brought you there. I think any blogger can do that. Absolutely! For example there are so many coupon bloggers out there, but a blog like Money Saving Mom is personal. Sarah Mae shares her struggles and her story. When people do this, it causes you to connect with them in a deeper way, and care about them! And on faith blogs, sharing your true feelings, struggles, your story can make all the difference. If you don’t, you can come off holier than thou. 🙂 No one wants to read that! Glad I found you through Allume. I look forward to reading your stories! Absolutely! I went to college for English, graduated with a BS. My favorite professor would always say “Don’t TELL me, SHOW me!” Regardless of the story, we can always show. I would agree to a certain degree. If it’s post after post after post not sharing any of the struggle or humanness, then yes sharing the story is a essential. However, I don’t feel the need to share the struggles in every other (or fill in the blank) post. For instance, there is also the problem with over sharing as well, which can be equally distasteful. That said, I would hope that friends & strangers who come to my blog would feel like they know me, and know I’m not portraying perfection either.